Background There are limited data regarding the timing of carbohydrate ingestion during a meal and postprandial glucose regulation. Methods Sixteen subjects with type 2 diabetes mellitus (T2DM) consumed the same meal on 3 days in random order: carbohydrate first, followed 10 min later by protein and vegetables; protein and vegetables first, followed 10 min later by carbohydrate; or all components together. Blood was sampled for glucose, insulin, glucagon-like peptide-1 (GLP-1), and glucagon measurements at baseline (just before meal ingestion) and subsequently at 30 min intervals up to 180 min. Results The incremental areas under the curve for glucose (iAUC0–180) and incremental glucose peaks were 53% and 54% lower, respectively, when carbohydrate was consumed last compared with carbohydrate consumed first (3124.7±501.2 vs 6703.5±904.6 mg/dL×180min, p<0.001; 34.7±4.1 vs 75.0±6.5 mg/dL, p<0.001) and 44% and 40% lower, respectively, compared with the all components together condition (3124.7±501.2 vs 5587.1±828.7 mg/dL×180min, p=0.003; 34.7±4.1 vs 58.2±5.9 mg/dL, p<0.001). Postprandial insulin excursions were lower (iAUC0–180: 7354.1±897.3 vs 9769.7±1002.1 µU/mL×min, p=0.003) and GLP-1 excursions higher (iAUC0–180: 3487.56±327.7 vs 2519.11±494.8 pg/mL×min, p=0.019) following the carbohydrate-last meal order compared with carbohydrate first. Conclusion The carbohydrate-last meal pattern may be an effective behavioral strategy to improve postprandial glycemia. Limited data on nutrient order during a meal suggests that consuming carbohydrate last lowers postprandial glucose excursions compared to carbohydrate consumed first. Protein preload stimulates insulin and incretin hormone secretion resulting in a lower postprandial glucose response. The carbohydrate-last meal pattern reduced postprandial glucose excursions compared to consuming carbohydrate first or all meal components together. In contrast to protein preloads, the carbohydrate-last meal pattern lead to lower glycemic and insulin excursions but higher glucagon-like peptide-1 response. The carbohydrate-last meal pattern may be an effective behavioral strategy to improve postprandial glucose control in patients with type 2 diabetes mellitus; feasibility and effectiveness need to be assessed in prospective studies. There are limited data, however, regarding the impact of the temporal sequence of carbohydrate ingestion during a meal on postprandial glycemia.10 11 In a previous pilot study of 11 patients with metformin-treated T2DM, we demonstrated that ingestion of protein and vegetables before carbohydrate led to lower postprandial glucose and insulin excursions for 120 min, compared with eating the same foods in the reverse order.11 No study has investigated the effects of the timing of carbohydrate ingestion during a meal on postprandial glucose, insulin and incretin hormone excursions. The aim of this study was to determine the optimal timing of carbohydrate ingestion during a meal that can lower postprandial glycemia in the setting of three real-world meal conditions and additionally explore the effect of food order on insulin and incretin hormone excursions. We postulated that consuming vegetables and protein together as the first course instead of carbohydrate would result in lower post-meal glucose excursions compared with the reverse order and consuming all meal components (protein, vegetables and carbohydrate) all together would result in intermediate effects. Male and female participants between 35 and 65 years of age, body mass index (BMI) 25–40 kg/m2 and metformin-treated T2DM of less than 10 years duration with HbA1c ≤8% were included in the study. Patients taking corticosteroids, antidiabetic medication other than metformin, and patients with chronic renal or hepatic disease or history of prior bariatric surgery were excluded. The study was approved by the Weill Cornell Medical College Institutional Review Board (IRB#1502015945). All participants gave written informed consent. Carbohydrate first (CF) (ciabatta bread and orange juice) over 10 min, a 10 min rest interval, and then protein (skinless grilled chicken breast) and vegetables (lettuce, tomatoes and cucumber with Italian vinaigrette) over 10 min. Protein and vegetables first over 10 min, a 10 min rest interval, and then carbohydrate over 10 min (carbohydrate last (CL)). All meal components together as a sandwich with each half consumed with half the orange juice over 10 min and a 10 min interval in between (sandwich (S)). Participants were closely monitored to ensure that all meals were consumed in their entirety within the allotted time. Blood samples were drawn from an in-dwelling venous cannula at baseline (just before meal ingestion) and at 30 min intervals up to 180 min after the start of the meal. Glucose concentrations were assessed in whole blood using a quantitative enzymatic photometry cassette from Alere (San Diego, California, USA). The intra-assay and inter-assay coefficients of variation are ≤6.2% and≤5.0%, respectively. The plasma concentrations of insulin and glucagon were determined using quantitative immunoradiometric assay kits from Millipore (St. Charles, Missouri, USA). The intra-assay and inter-assay coefficients of variation are ≤4.4% and ≤6.0% for insulin and ≤4.8% and≤6.4% for glucagon, respectively. The measurement range is 3.125–200.0 µU/mL for insulin and 4.7–150 pmol/L for glucagon. The plasma concentration of active GLP-1 was determined using an electrochemiluminescent assay kit from Meso Scale Diagnostics (Rockville, Maryland, USA) with collection of blood samples in the BD P800 blood collection tube containing a proprietary cocktail of protease, esterase and dipeptidyl peptidase IV inhibitors which provides immediate protection of bioactive peptides from degradation in plasma. The intra-assay and inter-assay coefficients of variation are ≤11.2% and ≤13.4%, respectively, and the measurement range is 0.24–1000 pg/mL. Demographics for participants were described as mean±SD. Glucose, insulin, iGLP-1 and glucagon concentrations (at time intervals of interest) and their respective incremental areas under the curves (iAUCs) at 180 min were described as mean±SEM for each group. Incremental glucose peaks were also described as mean±SEM. Linear mixed effects models accounting for correlation within the same participant were implemented for each outcome of interest to compare the three groups. Post-hoc analyses were performed by Tukey's method with Bonferroni adjustment. p Values were two-sided with statistical significance evaluated at the 0.05 alpha level or the Bonferroni-corrected 0.05 alpha level, where applicable. Analyses were performed in R V.3.4.0 (Vienna, Austria). The study population included 16 participants with overweight/obesity (nine female and seven male) with T2DM on a stable dose of metformin. The average (mean±SD) age and BMI were 57.7±7.6 years and 32.8±3.3 kg/m2, respectively. The average duration of diabetes among the participants was 3.8±2.4 years and the mean HbA1c was 6.5%±0.7%. One participant did not have sandwich data; however, this participant was not lost in analyses because mixed effects models handle missing values by maximum likelihood estimation and are robust to missing random data. However, sensitivity analyses by excluding this participant did not change the significance of results. There were no differences between baseline fasting glucose concentrations in the three meal conditions. Postprandial mean glucose concentrations were significantly decreased by 20.8%, 30.2%, and 23.1% at 30, 60, and 90 min (figure 1), respectively, and the iAUC0–180 was 53.4% lower (3124.7±501.2 vs 6703.5±904.6 mg/dL×180 min, p<0.001) following the CL meal order, compared with CF, the reverse meal order (table 2). CL meal pattern showed reduced postprandial glucose levels compared with the S meal pattern: a decrease of 19.8%, 25.2%, and 15.3% at 30, 60, and 90 min, respectively, and a decrease in iAUC0–180 of 44.1% (3124.7±501.2 vs 5587.1±828.7 mg/dL×180 min, p=0.003). Following the CL meal order, glucose levels plateaued between 90 and 180 min postprandially, whereas, there were marked fluctuations in glucose concentrations in the CF meal condition, with the glucose level being significantly lower than CL at 180 min. Incremental glucose peaks were 53.8% and 40.4% lower for the CL meal order compared with CF and S, respectively (34.7±4.1 vs 75.0±6.5 mg/dL, p<0.001; 34.7±4.1 vs 58.2±5.9 mg/dL, p<0.001) and 22.4% lower for S compared with CF (58.2±5.9 mg/dL vs 75.0±6.5 mg/dL, p<0.001). Postprandial glucose, insulin and glucagon-like peptide-1 (GLP-1) levels following carbohydrate-first (CF), carbohydrate-last (CL) and sandwich (S) meal orders. Values are mean±SEM. ¥Statistically significant differences (p<0.05) between CF and CL. ΘStatistically significant differences (p<0.05) between CF and S. ◊Statistically significant differences (p<0.05) between CL and S.
The CL meal resulted in lower insulin excursions; iAUC0–180 was 24.8% lower compared with CF (7354.1±897.3 vs 9769.7±1002.1 µU/mL×180 min, p=0.003). 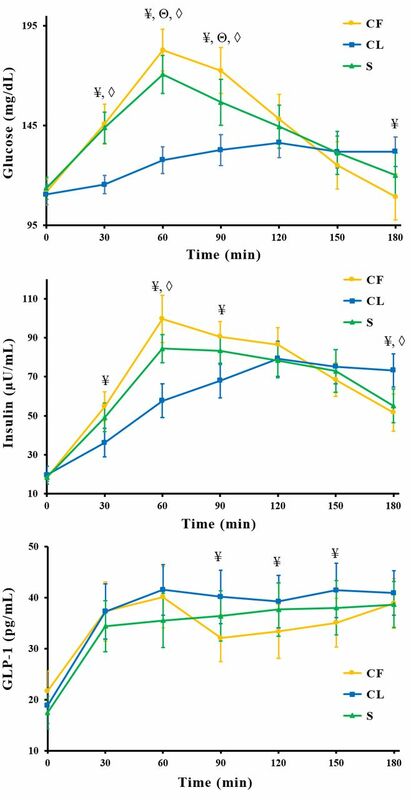 The insulin excursions were not significantly different between the CF and S meal conditions (7354.1±897.3 vs 8861.2±1050.5 µU/mL×180 min, p=0.137). The GLP-1 response to the CL meal order was greater compared with CF (3487.56±327.7 vs 2519.11±494.8 pg/mL×180 min, p=0.019) and similar to the S meal condition (3487.56±327.7 vs 3153.2±449.4 pg/mL×180 min, p=0.999). The glucagon excursions were not significantly different between the three meal conditions. In this study, we demonstrated that the temporal sequence of carbohydrate ingestion during a meal has significant impact on postprandial glucose regulation. These findings confirm and extend results from our previous pilot study11; the inclusion of a third nutrient order condition, a sandwich, had intermediate effects on glucose excursions compared with CL versus CF. Previous studies investigating the effect of premeal ingestion of whey protein have demonstrated that the glucose-lowering effect is accompanied by an insulinotropic response.6 7 In contrast, our results demonstrate that consumption of protein and vegetables first, followed by carbohydrate, reduces both postmeal glucose and insulin excursions, suggesting that the CL meal pattern requires less insulin controlling for carbohydrate amount. Modifying the rate of nutrient absorption is a therapeutic principle of particular relevance to diabetes. A plausible explanation for the attenuated glycemic response observed with the CL meal pattern is delayed gastric emptying and consequently slower rates of carbohydrate absorption, a mechanism that would not be entirely mediated by GLP-1. The finding of lower insulin iAUC in the context of increased GLP-1 excursions contrasts with the effect of protein preloads that augment both GLP-1 and insulin secretion6 7 12 and suggests a role for vegetable fiber in moderating this response. The effect of food order on postprandial glycemia in this study is comparable to the magnitude observed with pharmacological agents that preferentially target postprandial glycemia; acarbose and nateglinide reduce iAUCs by 31% and 64%, respectively, compared with placebo.13 14 In non-insulin treated patients, managed with diet/oral hypoglycemic agents, pramlintide was shown to lower glucose excursions by 57%.15 Limitations of our study include the small sample size and unclear generalizability to meals with different macronutrient compositions and patient populations including those with type 1 diabetes and prediabetes. Further study is needed to explore the mechanisms, including gastric emptying and rates of nutrient absorption with extended follow-up beyond 180 min. Strengths of the study include stringent study design and the use of real-world meals that suggest practical utility. In conclusion, our findings suggest that the timing of carbohydrate intake during a meal may have major effects on postprandial glucose excursions comparable in magnitude to many hypoglycemic drugs. APS and LJA are the guarantors of this work and, as such, had full access to all the data in the study and take responsibility for the data and the accuracy of the data analysis. The study was supported by Grant UL1 TR000457 of the Clinical and Translational Science Center at Weill Cornell Medical College. DSL is supported by mid-career award K24DK082730 from the National Institute of Diabetes and Digestive and Kidney Diseases.
. Postprandial glucose regulation: new data and new implications. Clin Ther 2005.
. Effect of whey on blood glucose and insulin responses to composite breakfast and lunch meals in type 2 diabetic subjects. Am J Clin Nutr 2005;82:69. Contributors APS, DSL and LJA: study concept and design. APS: drafting of the manuscript. APS, JA, SHT, AC and YSZ: conduct of study procedures and data acquisition. RGI and EM: data analysis. APS, JA, SHT and LJA: data interpretation. All the authors contributed to the reviewing and editing of the manuscript. APS and LJA are the guarantors of this work and, as such, had full access to all the data in the study and take responsibility for the data and the accuracy of the data analysis. Funding Louis & Rachel Rudin Foundation Grant, Diane & Darryl Mallah. Disclaimer LJA and DSL report receiving royalties for books on nutrition and obesity. Ethics approval Weill Cornell Medical College Institutional Review Board.